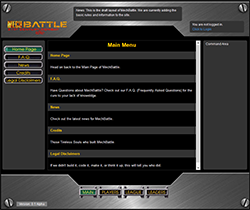 MechBattle is a free replacement for TKZ (The Killing Zone) online gaming league. TKZ allowed MechWarrior 2 players to battle each other online using the Netmech DOS program and Kali. Players would meet up in Kali, then drop to Netmech and setup a match. No only will this keep you informed of its progress, but give you one place to get everything you need to know about MechBattle including screenshots, videos, design and development news, and release dates.